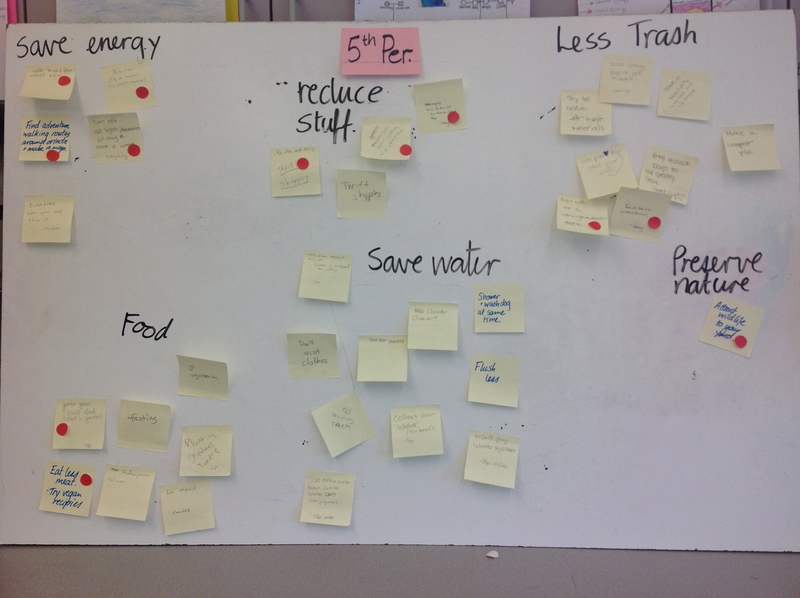 Project Based Learning has particular classroom management challenges – how do you manage materials? How do you teach and facilitate collaborative and innovative small groups? How do you manage 7 separate projects within each class? And how do you get the whole class to share research, agree to a specific class project or a particular solution? Basically, PBL is a delicate balance between the incredible engagement when kids have choice, versus unproductive/dangerous chaos that teachers fear. We’ve been at both ends of that see-saw and have relentlessly tried to learn from many fails. We share some successful ways meet the challenges of PBL so you can relax and enjoy projects along with your students. Assign rotating group roles. We use Leader/Chair, Materials, Time Check and Recorder/Reporter. Demonstrate how to chair a meeting in a ‘goldfish bowl’ format (one group is demonstrating while the rest of the class watches). We model how to lead the group – the leader invites each person to share their idea about X in turn. Then go round again if there are more ideas or if there is disagreement. The leader enforces the process that you set out at the start of class. It’s in SERVICE of the group, not the ‘boss’. The point is to model this closely on how chairs of adult committees and groups in the work place work most effectively. 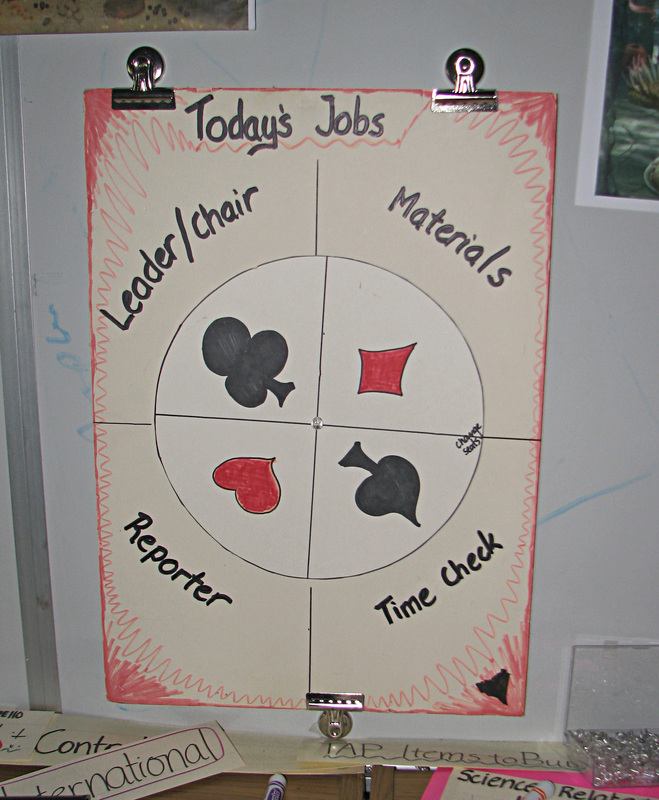 This week’s jobs wheel for cooperative group work. Develop group work ‘norms’: This is visible in the IDEO shopping cart challenge. Norms should be posted and regularly referred to and updated as needed. I should be better about doing this – management research strongly recommends this for adult groups because it makes the hidden culture visible to all. This is especially important for students with social and learning challenges. Innovative Brainstorming: It’s easy for the most popular kids to dominate, and for shyer students to just sit back and say nothing. The ‘norm’ is “With hold judgement’ and have all students with a dry erase marker to add their ideas onto the group white board. Choosing an idea for small groups: Winnowing down ideas requires that students understand the design or project requirements. 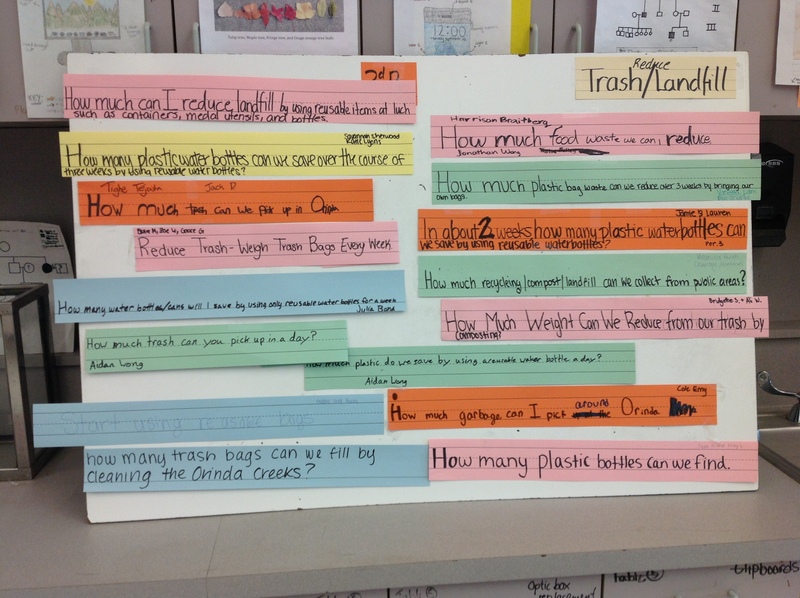 Reaching consensus can be done by all students taking a turn sharing their idea and explaining why. If there is disagreement, go round the group again for everyone to say how they feel about both sides of the issue. A show of thumbs for each idea can show agreement, or ‘can live with it’, it doesn’t have to be active agreement. This is difficult to do and will need the teacher circulating and checking in. Cheap masonite shower splash backing from Home Depot can be cut to the size of your group tables for a small fee at Home Depot. 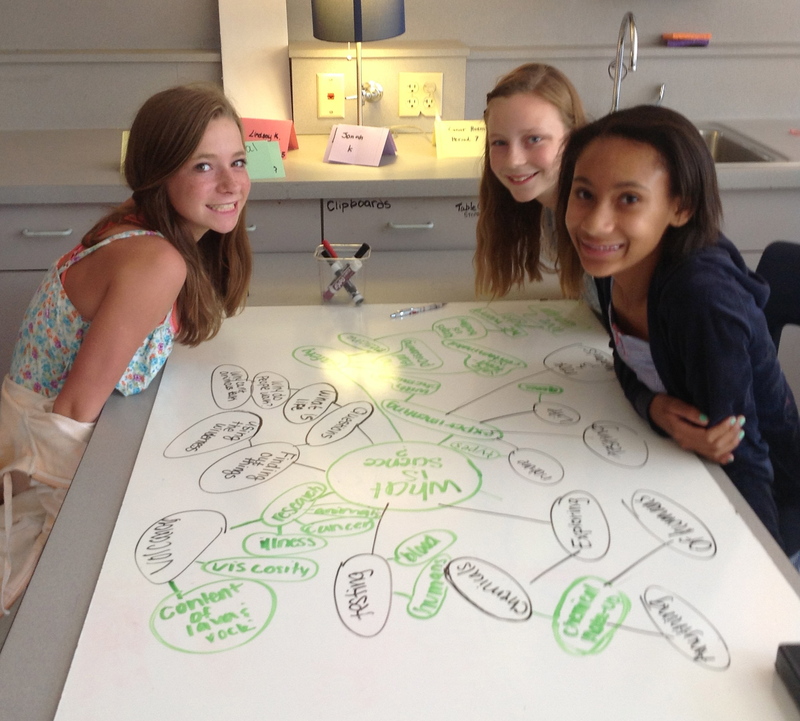 Use dry-erase pens for students to share brainstorming ideas and explanations with each other. Fun for students and easy for you to see their thinking. Notebooks: Our notebooks are for students to write and think in, and for you to see how they are thinking. We don’t grade their notebooks for content, just completion/effort. We often look over notebooks at their desks while students are doing seat work. It’s a friendly way to check in and give immediate verbal feedback. We do more formal evaluations and assessments but they are always on separate sheets. By separating out what is judged and what is not, students can feel freer to think and untangle concepts, record ideas and We give sheets to evaluate student work more closely. This keeps the pressure off them and allows their journal to be a private place for them to think outside the box without judgement. We are thinking about using Google Classroom for students who have a hard time writing. Here’s more detail on starting to use notebooks. Learning for Your Future Job: Make frequent links to the workplace through video clips such as IDEO’s Shopping Cart Challenge. Link group work to work their parents have to do. Most jobs require at least some level of working together. But be aware that some parents will be out of work and others will be partners in a law firm etc., so ask general questions that don’t put students on the spot. “Who has parents who have to work with others?” “Don’t raise your hands for this one but who has parents who have been stressed out by working with others?” is another way to get students to make the link. Be their ‘boss’ of the classroom ‘workplace’: This is a great way to frame coaching for groups and individuals that are not working well together. “If I were your boss, what would be happening right now?” is a way to motivate students to take note of coaching for how to participate well in groups. Poor interpersonal skills is the number one reason that adults lose jobs. Have students share research or ideas by writing key facts/ideas on small whiteboards, one per table. Then all come up and share their whiteboards in a line-up. They share one fact at a time. If they hear one they also wrote, they erase that (to avoid repetition). Keep going until all facts have been shared. The students listening can be adding ideas and facts to their notes. iPad Share-it: Students can share ideas by bringing up a photo or a website that illustrates their idea on an iPad. Then students look at each other’s iPad pics and get into groups of related ideas or examples. Each group can talk then share out their main idea. Yes/No Line-Up: For any ‘yes/no’ question (ex. Are you worried about climate change?) have students vote with their feet by standing to one side of the room for ‘yes’, the other side for ‘no’ and anywhere in between for yes, a bit, neutral etc. Poster Poker Chip/Penny Votes: Groups write their proposal and some key facts/evidence on their desk top whiteboard or poster paper. Each student gets a couple of poker chips. Then the class circulates and puts poker chips down on the poster proposals they like the best. It worksbetter if they are only allowed one poker chip on their own poster. 1. Brainstormed TAP project ideas sorted into categories. Dots show which look like fun. 3. Challenges sorted by topic. 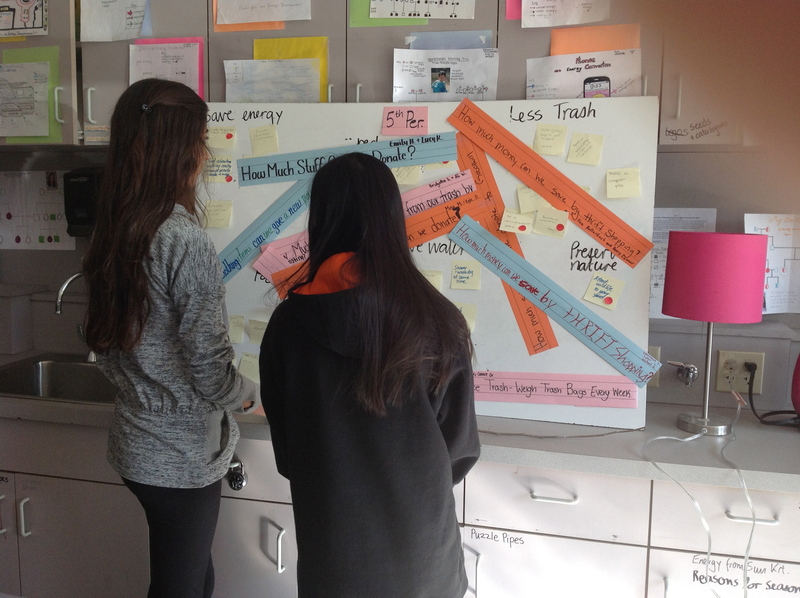 One topic board per table group. When students are researching say, what are the pros and cons of trees around campus, have a brainstorm of general ideas. Then separate their ideas into general categories. Each category can be the chart strip title on a large foam board – aim to have about the same number of categories/foam boards as you have table groups. Then have students move to sit nearest the category they’d like to research. Each student researches and writes an index card of information to post on their board. This way research can be shared amongst different classes and will help students as they write their final paper or grant proposal etc. Paper shopping bags for each group. One per group. A project requirement can be that the project and materials must fit into a paper shopping bag. The period and table number can be written on the bag. Each class has a designated storage area. This makes it easy to store and retrieve. Resource just the main materials you can think of for a project. 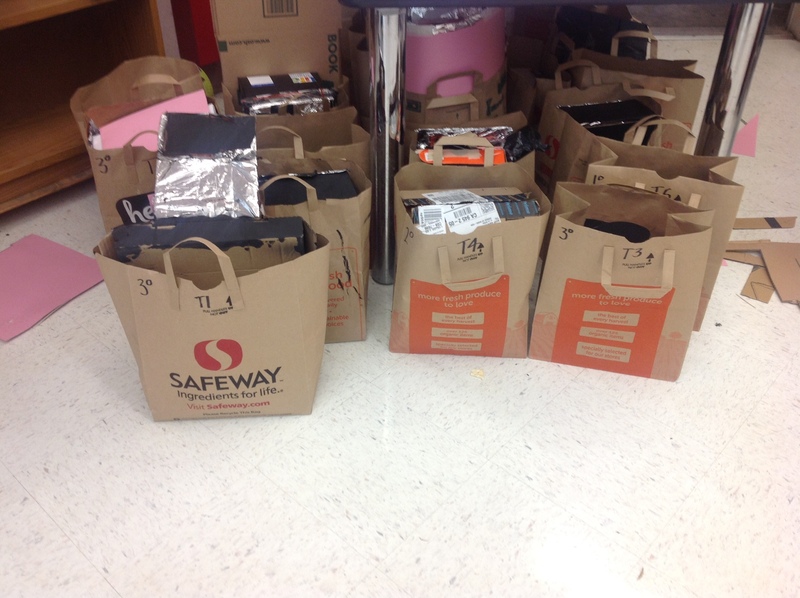 Extras can be brought from student’s homes or purchased as the need arises. It’s okay to not have everything perfect – it’s great to model this for students too. Set up materials like a cafeteria around the room that allows students to file past. Makes it easier for them to collect stuff at the start of class and put it back at the end. Think about management of possible hazards and messes: The biggest hazard in a crowded classroom is students tripping over backpacks. Figure out how to minimize that in your room. Have relevant safety supplies such as eye protection, gloves, aprons, newspaper, cardboard cutting surfaces etc. 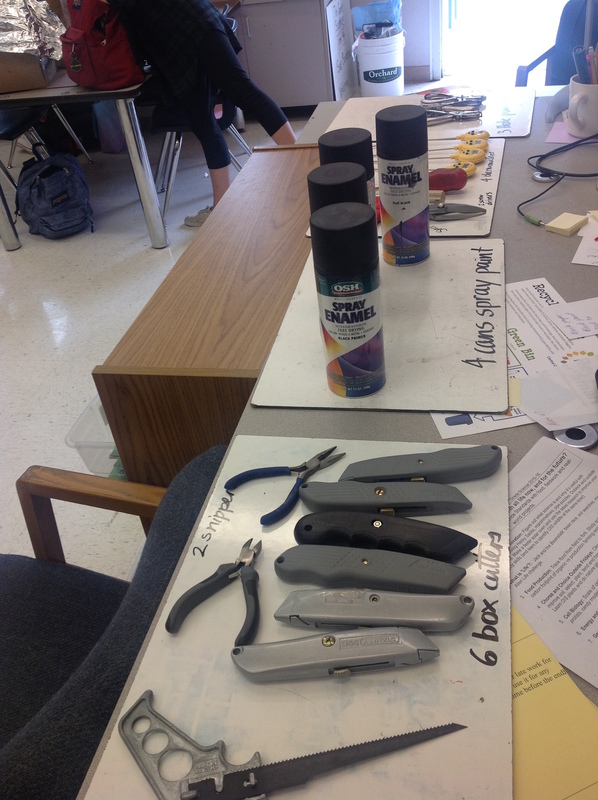 Train students how to use dangerous tools like box cutters and hazardous materials like spray paint. You can designate areas where they do these things. Supervise but don’t do it for them. They need the experience and they need the opportunity to earn your trust by being responsible. Students who are not get instantly taken off the project for the rest of the day, or sent to the office. Have first aid supplies easily available. Have clean up supplies easily available: a brush and dust pan and sponges etc. to manage messes. Keep tools and valuable, non-consumables at the front. I draw the outline of tools on cardboard so it’s easy to see that everything is back. LEAVE ENOUGH TIME for STUDENTS to clean up (not you!). Plan ahead how and where you want students to put supplies and projects. Model what you want. On future days, it will take less time to clean up. If you make a mistake and it’s chaos, stop. Regroup. Make some changes with or without student input. Admit what happened and model recovering from a ‘fail’. More specifics about materials management during the Solar Oven Project on this blog post.